Why choose K-Guard™ gutter guards? *Lifetime warranty offered through individual dealers. Call your local dealer for details. 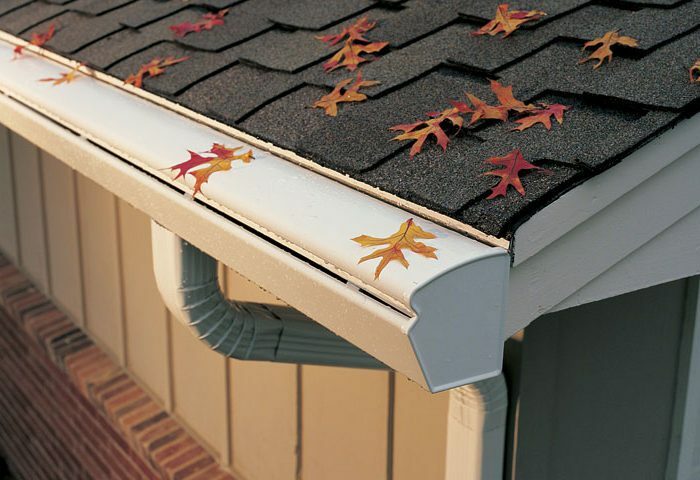 Are your gutters full of leaves, leaking, rotting or falling off your house? Toppers, helmets and covers will not stop the leaking and rotting, you need gutter guards by K-Guard. Held in place with our patented, high-impact, all-weather polymer hangers, K-Guard gutter guards use patented technology to keep leaves out of your gutter, and your home protected and looking great. Engineered to fit properly on home YES does not touch or interfere with roof and roof line. NO – Product designed to go on existing gutter-original house and roof design does not incorporate supplemental product. Product color matches gutter YES The hood and gutter are made of the same material and color. NO – Tries to match color of existing gutter. Prevent Gutter Leaks YES Product includes a new gutter and hood MAYBE – Product goes on existing gutters-if you have leaky, rotten gutters before product is installed, you will still have them. (i) The trough (gutter) and hood on K-Guard Leaf-Free Gutters are fully engineered to work together to provide the best possible protection against gutter clogs from leaves and debris. This is unlike standard toppers, covers and helmets, which are supplemental products that are sold to go on existing gutters. The K-Guard system is held in place with our patented, high-impact, all-weather polymer hangers that are screwed directly into your fascia board and rafter tails, providing superior strength and durability. (ii) When fully-integrated and fully-engineered K-Guard Leaf-Free Gutters are installed on your home, they are installed at the proper height based on engineering studies that incorporate tests results over several years. Toppers, and helmets and covers for gutters, are installed on your existing gutters with no forethought on height in relation to your roof. The architect never designed the gutter to have a topper and therefore did not leave room to accommodate a topper. As a result, these toppers appear clunky and inappropriately sized. They also do not function very well. 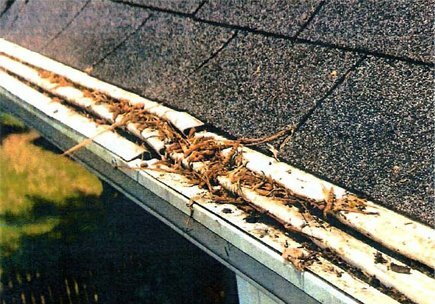 (iii) If your gutters are leaking, rotting or falling off your house, toppers, helmets and covers will not stop the leaking and rotting. Hammering a large nail into a hole that is already too big will not stop the gutter from eventually pulling away from your house. K-Guard Leaf-Free Gutters include a brand new trough (gutter) with the hood so you do not have to be burdened with these on-going problems. A company selling a topper, helmet or cover for your existing gutters might point out how much cheaper their product is compared to the cost of K-Guard Leaf-Free Gutters. Do not be fooled! With them, you are only getting a topper product. With K-Guard Leaf-Free Gutters you will have a complete gutter protection system, both trough (gutter) and hood. When they start working on your house and stop to tell you that you need new gutters, guess what? Their price will exceed our K-Guard Leaf-Free Gutters price. Do not fall for their apples-to-oranges comparisons. Calculate the prices based on the complete system trough (gutter) and hood, and you will see that K-Guard Leaf-Free Gutters is an exceptional deal. All of these topper products have to tuck into a row of shingles. These products will inevitably cost you a lot more money once the roof shingles dissolve and cause leaks. K-Guard Leaf-Free Gutters never touch your roof, and therefore will never void a homeowner’s roof warranty. K-Guard Leaf-Free Gutters is also the only leaf-free gutter system with a rear drainage channel so that water has two points of entry into the trough (gutter). The rear drainage channel prevents wind-blown rain from running up under your roof line and possibly freezing. Topper products, which again, are tucked under your shingles, will serve as an open door to this type of rain. K-Guard Gutter Guards work as a full protection system with your roof. The shingles on your roof are flat and overlapping for a very good reason—to keep water out! Toppers will lift your shingles, and over time cause roof problems. K-Guard Leaf-Free Gutters will keep out the leaves and provide superior water drainage, but how they will look on your house? Fantastic! K-Guard Leaf-Free Gutters were engineered for installation onto existing houses, and incorporate time-studied engineering principles into their design. K-Guard Leaf-Free Gutters don’t have any of the sharper edges and vertical faces that other products have. This allows K-Guard Gutters to soften the look of your home. K-Guard Leaf-Free Gutters will look like crown molding on the outside of your house. Because you receive a trough (gutter) and hood made from the same material, the colors are the same. Topper products are supplemental products that do not address the simple fact that the engineering of your house, gutter, and roof never took into account the addition of a topper product. When you factor in that these toppers will never match exactly the color of your existing gutters, they appear clunky, boxy, and very much out of place on an existing home. Once again, thank you for considering K-Guard® Leaf-Free Gutters. We are sure that if you choose to have our gutter protection system installed, it will prove to be one of the best decisions you have ever made with regards to protecting the life of your home. K-Guard’s fully integrated system’s rear drainage channel will become clogged. NOT TRUE! Because rain hits the gutter from various angles, K-Guard’s rear drainage channel allows wind-blown rain and rain coming at the gutter from various angles to enter properly —other systems do not. K-Guard’s integrated hood will become dislodged by high winds. NOT TRUE! The K-Guard Leaf Free Gutter System has been tested to withstand gale-force winds. With over 30 million feet of K-Guard Gutter installed, we have never had any reports of the integrated hood coming loose or pulling away from the trough. The K-Guard Leaf-Free System is similar to the topper products out there and only comes in 3-4 foot sections. NOT TRUE! K-Guard is a fully-integrated and fully-engineered seamless leaf-free gutter system. The K-Guard system’s hood needs to tuck under your roof shingles, and thus, will void your roof’s warranty. NOT TRUE! The hood of the K-Guard Leaf Free Gutter System is supported by one of the strongest hangers on the market. The hanger is capable of withstanding up to 125 lbs. of pressure on its nose! Because the hanger is so strong, the hood and trough are held in place without the aid of the roof itself. K-Guard’s patented hangers are screwed directly into your fascia board and/or rafter tails. The K-Guard Gutter will never touch your roof, nor tuck under your shingles. K-Guard really looks nice! This is TRUE! The smooth contours of the K-Guard Leaf Free Gutter System give the same appearance of having crown molding on your home. Our competitors would never, ever admit that! Make the last time you cleaned your gutters, the last time you clean your gutters! The product can't be beat, the warranty is fantastic, and the gutter system looks gorgeous on my house! I have had my kguard system for 13 years and have not had to clean my gutters once in that time. Heavy gauge material and oversize downspouts means I never have to worry about the system flowing over the front edge. Best leaf free gutter system on the market. No other product even comes close. Replaced all the gutters and downspouts. Workers arrived promptly and kept me informed throughout the entire process. Gutters have been clog free and were definitely worth the money. Are you a pro? Apply to be a gutter guard dealer with K-Guard!